No, i dont think they have....my town has plenty of coffee shops wether they be traditional or "trendy" but there are still plenty of people from all walks of life that still go in them...although i cant speak for other towns or cities. No, if anything coffee culture has been improved. Britain is nothing like the Britain I was born to and grew up with in the 1960's. I was born in January 1960. I can't stand Portsmouth any more - where I've lived all my life. I can't afford to move away either. I really hate Britain now, it's changed beyond recognition. We let foreigners take over everything. We have handed our country over to foreigners on a plate. I old times, people fought to take your country, now we are so lilly-livered, we just give it to them. I've just had to go for a measles jab (despite having measles as a child and being vaccinated twice), because - foreigners have brought it inot our country via Spain, and I was told that Chichester (close to Portsmouth) now has an epidemic of measles. They are not only bringing in their crap food and drinks, but also diseases that we saw the back of in the 70's!!!! Britain is **** - admit. God you are such a racist,the question was about coffee shops! !not your biased view of Britain!! Poor wikkle racist. Wheat, bread, beer, apples, grapes, onions, leeks, oats, peas, turnips, carrots, tea, coffee, chocolate, pepper, potatoes, tomatoes, rhubarb, fish and chips, all brought here by foreigners, as are many other foodstuffs. Portsmouth itself was founded by the Romans, you almost certainly have 'foreign genes' in your dna, your laughable notion that Portsmouth was a paradise in the 60s is not bourne out by the fact that 10s of thousands of people abandoned the town during that decade with the collapse of the shilpbuilding industry. Still, you carry on being bitter for a time that never existed, eating the foreign food and drink that you profess to hate. I would say no. In my town we have a big choice from small independents to larger chains and those in depertment stores. There is plenty of choice for everyone and you see people of all ages and from all walks of life in the different places. I see it as a personal choice and I use a mixture depending on whom I am with and where I am. I don't often drink coffee but these places are often the only place available to visit for a drink while out shopping, unfortunately they have no idea how to make tea or how to treat a customer. Do they really have to spend four or five minutes making each cup of coffee? Have they even noticed the queue that builds up waiting to be served? It would be vaguely acceptable if they offered a waiter service, but no you have to stand at the counter wait on the 'barrista' performance and then find your own sugar, spoon, napkin from a bench and carry it to your table. I have wailed on this site several times about the lack of tea making skills in any kind of cafe (a cup of warm water and a tea bag and carton of milk handed separately will never be good enough) but a big problem is that they seem indifferent to the needs of the customer. Yes they have, in a space of 100 yards about every other place is a coffee shop. I do not frequent them as the coffee is too strong and expensive. If I have coffee it is somewhere like KFC or mcdonalds. I try to use the independent coffee shops as much as possible where you can be treated as a valued customer. I like to be served not having to queue whilst balancing my shopping. I understand why there are so many coffee shops in our high streets when I see what they charge for a cup of average coffee. I cannot afford this luxury and continue to make my own coffee at home. Bring back our old shops, woolworths, BHS, Timothy Whites and Maplins? I don't know what hipsters are (except for low slung trousers)I see the word everywhere and am at a complete loss to know what they are. Most of the high streets near where I live is full of pound stores, bookies and loan/pawn shops. Some coffee chains around here would be a massive improvement if we could get them. I've never been inside a coffee shop, hipster or otherwise, and because I don't really go to towns much anymore I don't even pass them to see what they look like. I agree, that the pricing of the Hipster Caffee's extends the old fashioned simple coffees, but the selections they offer for people having allergies and intolerances is significant. Organic Coffee and diverse milk varieties (such as Almond, Oat, Coconut), Glutenfree options for lunch and pastries make the price, first seen unreasonable, reasonable. For me personally, makes it my life much easier as a gluten sensitive and lactose intolerant person. Our local, independent coffee shops (well cafés) serve excellent coffee, cakes, sandwiches, soups etc. Doesn't take them ages to prepare them and they're lots cheaper than the chains. No idea. I don’t buy expensive coffee. I can make my own for about 2p a cup. Why do these so-called trained waiters / baristas make scalding hot coffee when it’s supposed to be drunk warm? Peole love to go out for a coffee and socialise. They are here to stay. I drink tea. I’m British. My local high street has a few coffee shops and about 20 phone shops that fix, unblock and do god knows what else to a smartphone. Its just boring now. Definitely not. 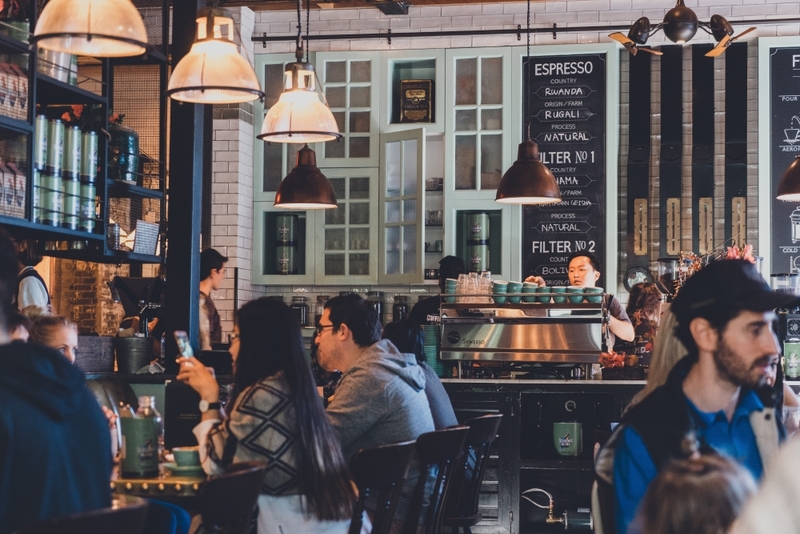 The more popular the coffee shops becomes, the more choice we as the public has to choose from. The trendier or more hipster coffee places only seek to add more comfort and familiarity. More often than not, they mix a lot of the retro with the modern. It’s nice to have a mixture of both traditional and contemporary.